Northampton, MA (July 4, 2018) – A pedestrian suffered injuries after being struck by a police cruiser in Northampton, Massachusetts on Tuesday. The collision took place in Pulaski Park while police were en route to a call about a suicidal person with a knife. The woman who was struck suffered non life-threatening injuries. She was transported to a nearby hospital to receive further evaluation, according to Northampton Police Chief Jodi Kasper. The woman’s name has not been released. Police were able to apprehend the knife-wielding suspect with no additional injuries to anyone involved. It is unclear at this time if the responsible officer will be charged with hitting the pedestrian. Police officers, like all other drivers, have a legal duty to obey the rules of the road. A police officer must refrain from negligent behaviors while driving their patrol car on duty. 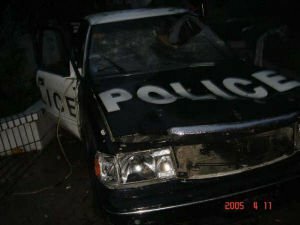 If an officer is negligent and their negligence leads to a collision, the officer as well as the police department can face legal responsibility for the injuries sustained. In this case, there are not enough details to say with certainty that the officer should be held legally responsible. The subsequent police investigation will reveal whether the officer was negligent by hitting the woman and whether the woman ultimately has a personal injury claim.